Another card for the Dare to Get Dirty Challenges over at Splitcoast. It’s fun to combine challenges on cards and I’ve done that again with this one. Simple layering again. The flower has been hand made from a die cut. The petals have all been shaped, inked and edged in black. I like to use a piercing tool to shape my flowers. It’s a great size to shape the petals! 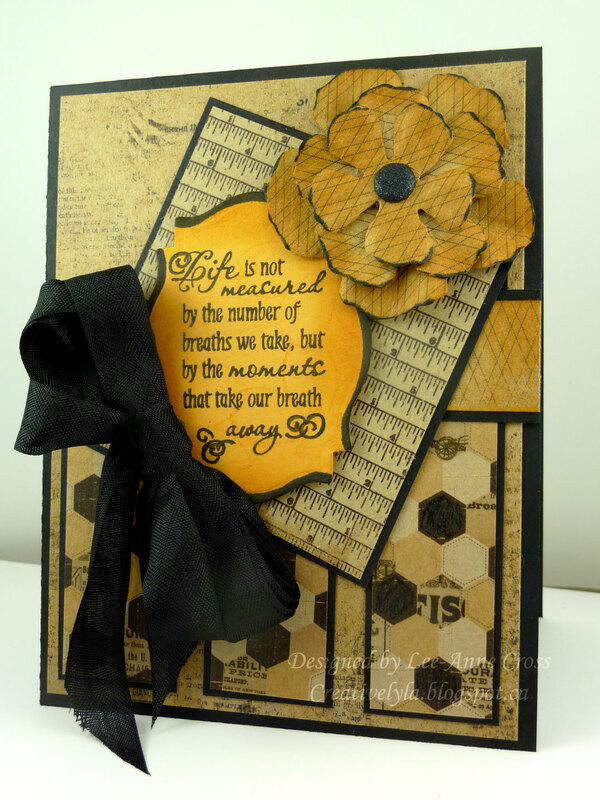 The sentiment has been die cut; a flower image has been stamped off and stamped in the background; then sponged and edged with a Copic marker. I only used the marker on the rounded edges and left the corners for a different sort of look. I added a little sparkle with a black Spica marker to the curlicues on the sentiment and to some of the black hexagon shapes in the patterned paper. Unfortunately, the picture doesn’t really show the sparkle. The center to the flower has a little sparkle too! Guess you’ll have to take my word for it (grin)! Next comes a simple black bow and done! Hopefully I can get a few more challenges done yet this weekend… See you soon! Absolutely loving your CAS card, Lee-Anne! Gorgeous rich colors and layout!! Love the sentiment! So fun! Love the warm colors and that big beautiful bow.